History - Persian, popular breed of longhaired cat. More Persians are registered with the Cat Fanciers' Association, the largest feline registering body in the United States, than any other breed of cat. Persians are aristocratic but by no means delicate, with long, plush coats and heavy bones. They have broad, massive skulls with round faces and a domed forehead; small rounded ears; and broad, snub noses with a decided break. The coat is long from head to tail, with an immense ruff and frills between the front legs. Persians probably originated in Asia Minor; they were introduced to Europe in the 1700s, where they were called French cats or Angoras. When short, stocky longhaired cats from Iran (formerly known as Persia) were incorporated into the gene pool, the breed became known as Persians. They became popular in Britain during Queen Victoria's reign; she and other members of the royal family kept blue Persians. 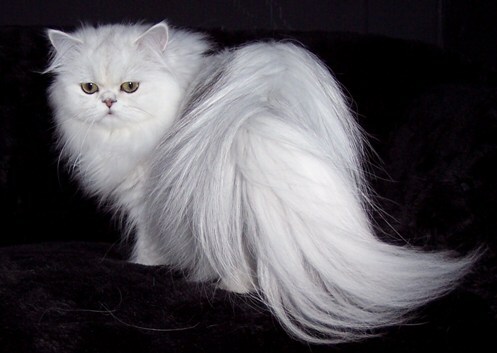 They have been exhibited in cat shows as a recognized breed for more than a hundred years; the first cat show in Britain, in 1871, included black, blue, and white Persians. The Persian has changed significantly since then; early Persians had much longer bodies, larger ears, smaller eyes, and longer faces than today's short-faced, round-eyed Persians. This is because the longer, more slender Angora type gradually went out of favor after the compact, sturdy Iranian type was introduced. Colors and Coats Types Available - Persians have long flowing coats. They have either a silky coat or a cotton coat. The silky coat is easier to care for and require less grooming . Cotton coats are generally drier and require more bathing and brushing. Persians come in many colors, solids and patched, smokes, torte and shaded. Grooming and Care - Although felines have a reputation for being relatively independent, domestic cats require love and attention from their owners. A balanced daily diet, such as that provided by high-quality commercial food, is essential for health and longevity, as is a regular supply of fresh water. Regular cleaning of litter pans is necessary to prevent disease; some will refuse to use a badly soiled litter pan. Claws should be trimmed frequently. To prevent damage to furniture, cats that live indoors should be provided with a scratching post, preferably covered with a rough material such as sisal rope. They use their tongues to clean their coats, and they normally swallow any loose hair. All felines, including shorthairs, should be brushed weekly to remove loose hair; this will help prevent hairballs from forming in their stomachs. A few longhaired breeds, such as the Persian and the Himalayan, require daily combing to prevent their long, soft fur from matting. Best Suitable Environment - Some domestic cat owners choose to keep their cats indoors; others permit their cats to go outdoors some or all of the time. The outdoors, however, poses many hazards to felines, even in rural areas. An outdoor cat may be struck by a car, poisoned by common pesticides, or injured by other animals (other cats, dogs, and, in some areas, wild animals such as coyotes). In addition, the cat may be exposed to the fatal feline diseases that are endemic in the stray cat population. According to some authorities, a cat that is permitted outdoors has an average life expectancy of two to three years; conversely, the average life expectancy of an indoor cat is about 15 years. Although an indoor feline does not enjoy the same freedom as an outdoor one, many live happy and complete lives. It is easier to keep them indoors if it has not become accustomed to going out. Some indoor pets need exercise just as outdoor ones do. Some cats can be trained to use a harness leash. Often, the easiest way to provide an indoor cat with exercise and stimulation is to provide a feline companion. Personality Traits - Persians have a calm demeanor. They are playful and loving, very talkative. They love attention and want to be in the same area as you are.